Yesterday, I was chatting with a friend of mine in Facebook. A question arose from him “Is there any way to connect RSS feed to our Facebook profile?”. Yes, sure we can. By using a Facebook app called “Social RSS”, it is possible to show your blog’s feed in your Facebook Profile/ Fans page. First, log into Facebook. Go to “Social RSS” application page. There, click on the “Go to application” button below the application picture. Click on Allow button, if a page asking for you permission to allow the application appears. Under the “Feed Settings” tab, enter blog’s title, feed URL as shown in image below. After done click on the “Update” button. Now click on the “Display Options” tab and set how your feed look like. For example, my settings look like this. But, you can adjust the settings as you wish. But, don’t forget to click “Update” button. Now, go to “Application Settings” option under “Settings” menu. Scroll down until you see Social RSS application. 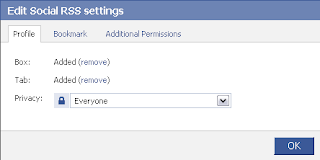 Click on “Edit Settings” option near Social RSS application. An “Edit Social RSS Settings” pop-up window will appear. Select “Add” option for Box and Tab. Now go to your Profile page. Click on “Boxes” tab. Click on the pencil icon on the Social RSS box and select “Move to Wall Tab” option. 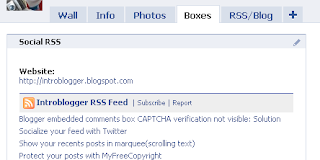 And now it will open your Profile page with your blog’s RSS Feed in sidebar. And now you’re done. Don’t hesistate to ask your questions regarding this via comments. Update 09/01/2010: To add this application in you fan’s page, go to your page and click on the “Edit Page” option below the profile picture. When “Edit Page” opens, scroll down until you see “More applications” option and click “browse more“. It will open application page. Type “Social RSS” in search box and search. 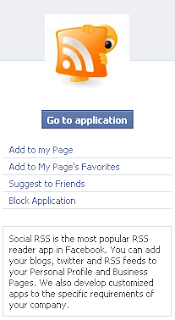 Clicking on “Social RSS” will open application page. Select “Add to my page” option. Now, select the page you want to add it. Enter the feed URL, title and edit display options. Go back to your page.There, click “Edit Page” again. Search for Social RSS in applications list and click on “Application Settings” below the Social RSS application. Click “Add” option next to Tab and Box. And now follow the previous steps stated above to show the box in your sidebar.